My mind was all about bread making since last week and when I met up with a friend recently, it was out of nowhere that we suddenly dwell onto the topics of bread making too. So that somehow affirmed my commitment to bread making come the following weekend. Old school breads are still my favourite despite the rising influx of artisan breads. 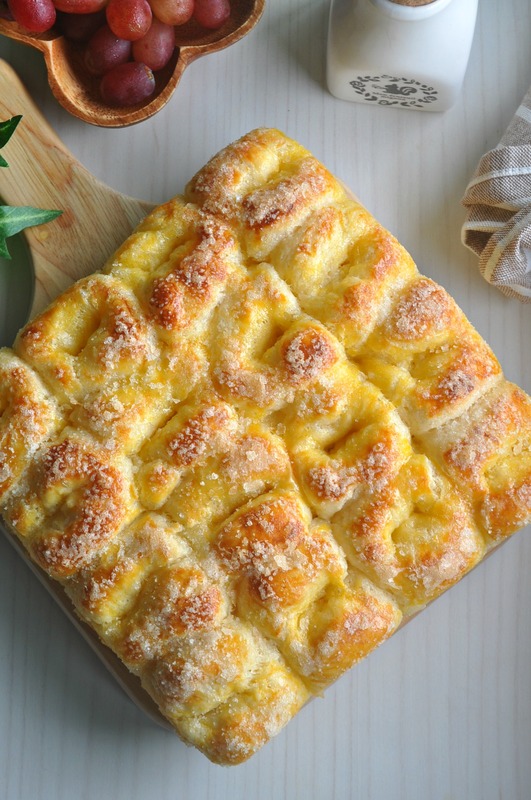 Especially traditional breads like such, rich luscious butter in bread coated with a generous amount of sugar served in a pull apart form. 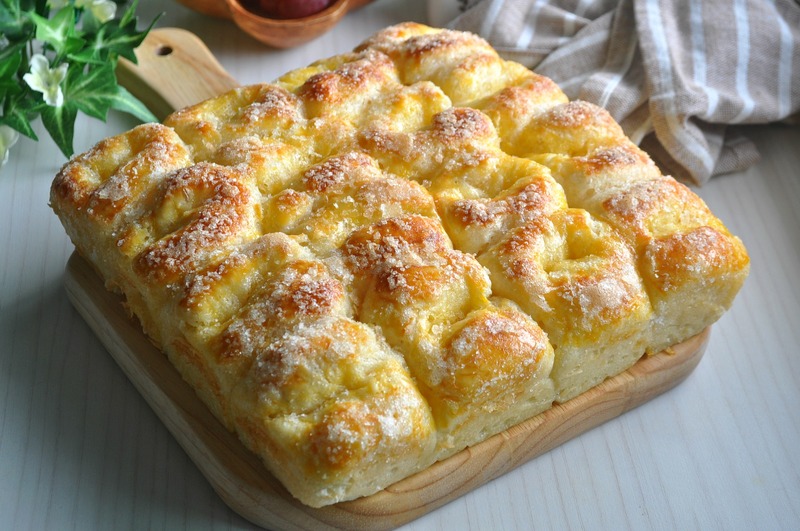 I am particularly fond of pull apart bread as well since they are generally smaller in per piece portion and can be finished up easily. 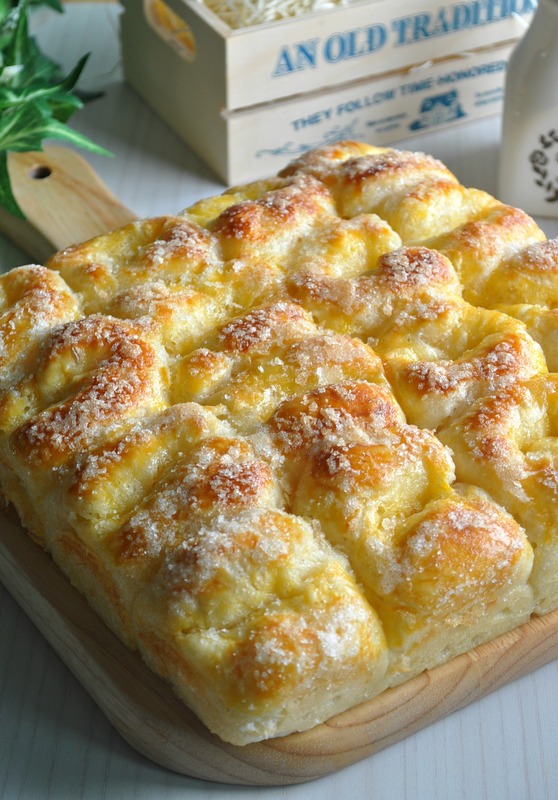 Although there has been various kinds of bread making method, but I feel that no matter what method it is, as long as they are freshly made from home, they are still the best as it can be ! And I also realise that as long as there’s a so called “cooked dough” prior to making the bread dough, the result will yield a softer bread in which they can last longer too. In addition to the cooked dough, a twice proofing will also allow for a softer than usual bread which the softness can perhaps stretch up to the 3rd day still ! Although bread making is a laborious task, but the satisfaction yielded from the end results is beyond describable. The aroma of freshly baked breads that fills the entire household during the baking process is something that I am sure no one can resist. Bread making is certainly not as intimidating as you imagine it to be ! And home baked breads is definitely more rewarding than any kinds of baked goods !! Enjoy !! Prepare the overnight dough by combining the boiling water and bread flour. Wrap it with a cling wrap and leave it overnight in the fridge. Add the bread flour, plain flour, sugar, milk powder and salt in a mixing bowl. Create a dent in the middle of the flour and add in the yeast. Mix well for approximately 30 seconds on low speed. Add in the water slowly before adding the egg. Beat on low to medium speed till a rough dough is formed. Add in the overnight dough and beat till it is well combined. Add in the butter and beat till an elastic dough is formed (when the dough can be stretched thinly). Remove the dough and further knead the dough with hands on a floured surface for approximately another 1 minute. Set it aside in a mixing bowl to allow it to proof for 40 minutes. Cover the bowl with a damp cloth while proofing. When the dough has expanded or doubled in volume, punch it gently to release the air. Separate the dough into 12 portions and set it aside for approximately 10 minutes. Further divide each dough into 30g each and place them in a 8 inch greased square tin. Continue until all the rest of the dough are used up. Allow the bread dough in the tin to proof further for another 40 minutes. To speed up proofing, you can add some boiling water in a bowl and place the tin over it and leave them in an enclosed area, such as in the microwave or oven (without power on). When the dough has doubled in size or touching each other, make a slit in the middle of each piece of bread. 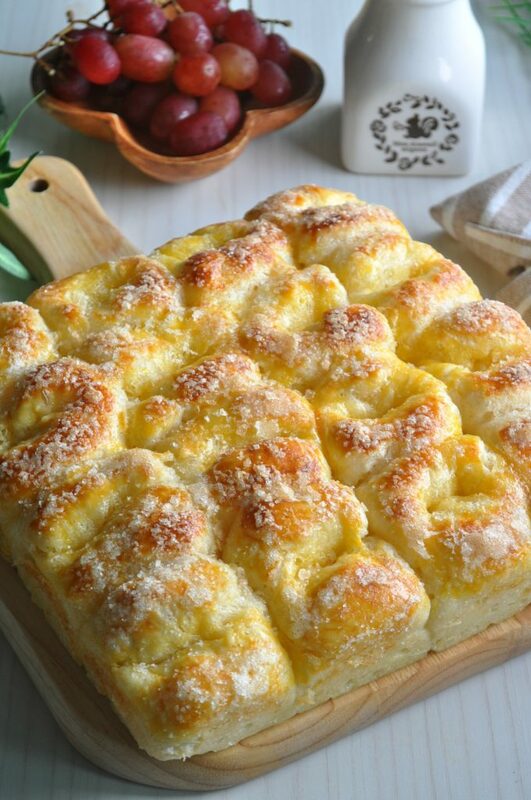 Add in a small piece of butter cube in each slit, egg wash the bread and sprinkle generously with sugar on top. 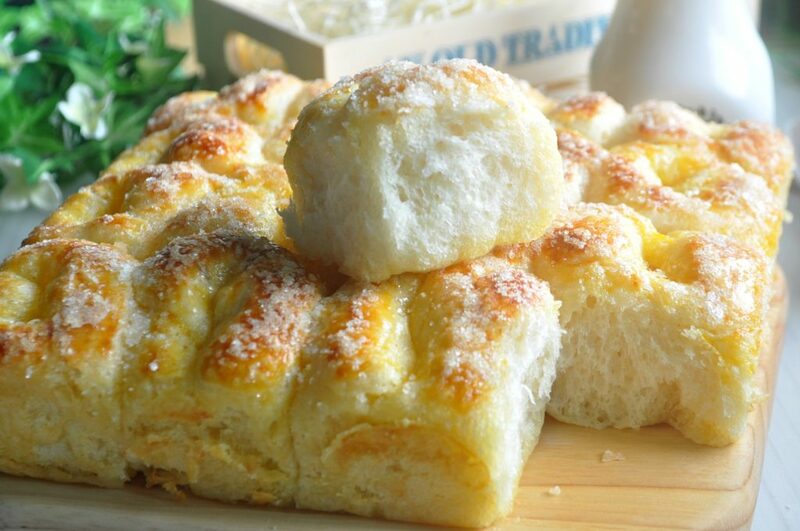 Bake it in the pre-heated oven at 180 degrees for around 20 minutes or until golden brown. Unmould when the bread has cooled slightly. Serve hot and enjoy ! Salt will inhibits yeast growth. Hence, creating a dent or well in the middle of the flours while adding the yeast is to prevent it from direct interaction with the salt and "killing" the yeast. Place the salt at one corner in the mixing bowl can help to prevent that as well. The bread looks so nice and yummy!! Can I use regular milk instead of milk powder and how much? 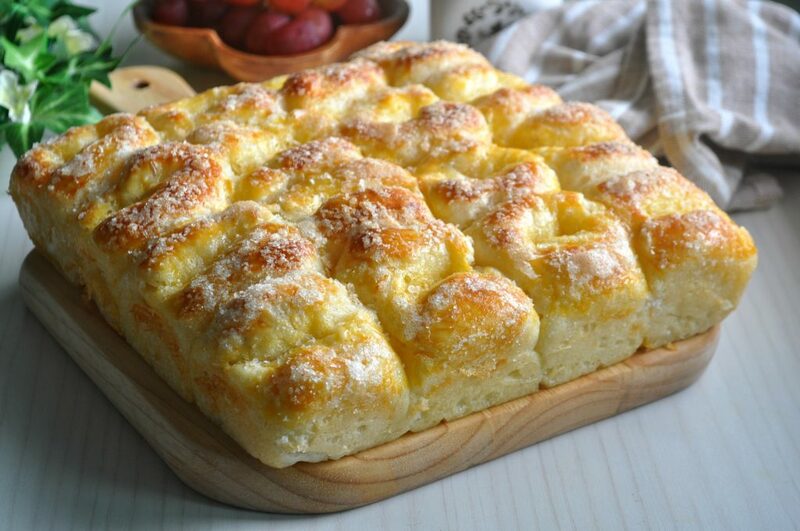 Hihi, for this recipe, if milk powder is not available, you can omit it and replace it with same quantity of bread flour. Hello! Do I have to mix the instant yeast with water first? Or do I just add it to the flour mixture? Also is the baking temp 350degrees Fahrenheit? It say 180. Thank you!! Hi, I mix the yeast into the flour mixture, no need to mix with water first. And it’s 180 degrees C which is around 350 Fahrenheit. Can u please put the recipe in cups n teaspoon / table spoons I’m am a bit older this would be so helpful to a lot of us. Do you have the conversion for the grams please?